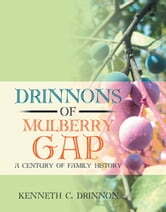 Drinnons of Mulberry Gap author, Kenneth C. Drinnon, decided a few years ago to begin writing a permanent record of the results of his several years collecting and compiling information on his Drinnon ancestors, which he traced back nine generations to Walter Drinnon/Drinnen who came from County Antrim, Ireland. He also compiled a family tree on Family Tree Maker and uploaded to FTMs composite tree several years ago. 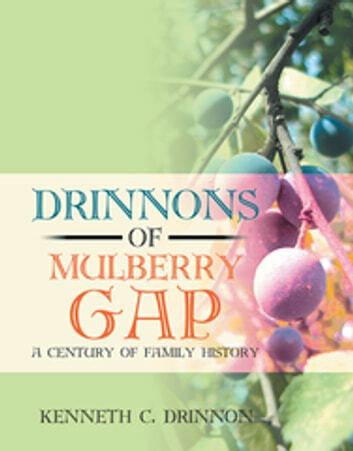 Drinnons of Mulberry Gap was originally self-published in 2001 on a subscription basis in both hard and soft back covers at the urging of a few family members. This new publication seeks to satisfy the desires of others who have requested copies. Although his family name is spelled D-r-i-n-n-o-n, his research, which goes back to the early 1700s, finds that D-r-i-n-n-e-n was the most prominent spelling in records of early ancestors. These early records used other spellings, namely: D-r-e-n-i-n-g, D-r-e-n-n-i-n-g, and D-r-e-n-n-o-n. But the D-r-i-n-n-o-n spelling was the most prominent of the 1800s Hawkins/Hancock County, Tennessee census records. It appears that early ancestors changed the spelling upon migrating to Hawkins County around the turn of the eighteenth century, on land that eventually became Hancock County. Thomas J. Drinnon Sr. was the founder of the original Drinnon family to settle at Mulberry Gap, Hancock County, Tennessee. And the book is primarily about him and his wife, Rutha Johns, and their descendants who lived there for a century. However, it is appropriate and beneficial for the reader to have the included information on Thomass ancestors, beginning with Walter Drinnon who settled in the Colonies sometime in the 1730s and continuing down through the ensuing generations. Kenneth Cleveland Drinnon, a native of Mulberry Gap, Hancock County, Tennessee, was born in Lee County, Virginia, on November 30, 1924, to Glenn B. and Willie Mae Overton Drinnon. He attended Mulberry Gap Elementary School and graduated at age seventeen from Hancock County High School at Sneedville, Tennessee, in 1942. Following his United States Army Air Force service, he attended Lincoln Memorial University for two years and graduated from the University of Tennessee in 1950 with a bachelor of science degree in electrical engineering. He was employed by the Tennessee Valley Authority in the design of electric powergenerating plants for thirty-two years and became a licensed engineer in Tennessee. In November 2011, Drinnon self-published his USAAF memoir, Wings of Tru Love via Xlibris. He married Janis Bolton while attending Lincoln Memorial University and had one daughter, Dena Daryl Drinnon, who married David E. Foulk and had three children, Bethany, Jonathan, and Julia. Russell Fork River Basin Area, KY Pict.